Starts at Horseshoe Lake campground at site 5. Enter and bear right about 20 feet in. 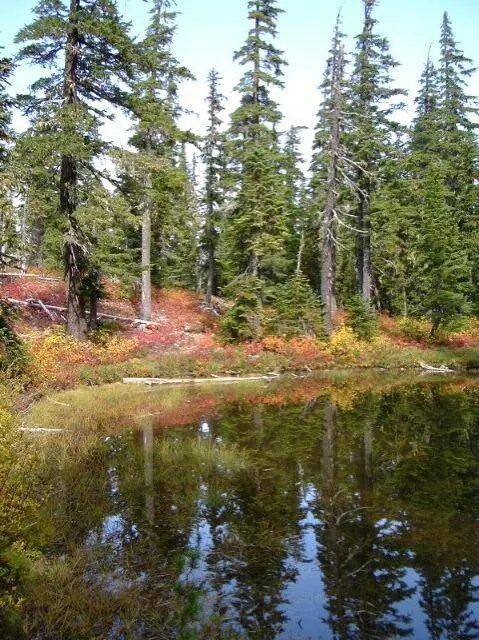 Leads up to the Skyline Trail (PCT 2000) through a beautiful area of pools and meadows. Level until a modest climb reaching up into the saddle. A seasonal spring is available on the left near the saddle. One mile long. This trail also has been named the “Rondy Trail” in memory of Howard Rondthaler, who was a trails supervisor in the district for many years. There is a commemorative sign partway down the trail. Retains snow late into June. See the Olallie Scenic Area map available at the District office in Estacada.